IT’S THE FIRST DAY OF FASHION WEEK!! I had the hardest time deciding on what to wear! Well, its not that I didn’t have enough clothes to choose from, it’s the fact of styling appropriately to see which days you want to wear what on! So for Day No.1 I wanted to go bold! What is more bold than Red, Black and White? This is a color combination I never wear and figured NYFW was a great place to test this look out! It was a hit! I wore this look as I was walking into my first show of the Mercedes-Benz Fashion Week season. Earlier that day I attended Timo Weiland’s show at Pier 59 but these photos are of me walking to the tents at Lincoln Center to see a fully pack day of shows which started with Mara Hoffman and continued with Desigual, Saunder, Hanley Mellon, Julianna Bass, Kempner, and the Red Dress Collection. You’s see my reviews of these wonderful shows shortly. 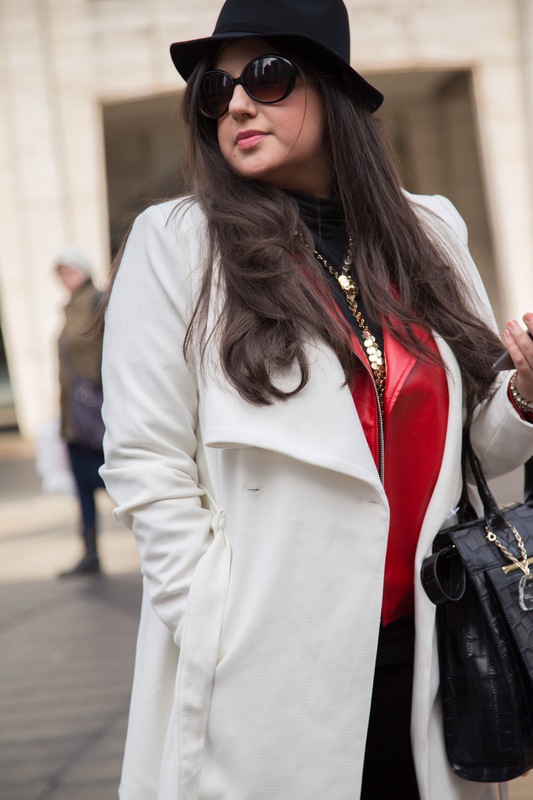 Being that I had the Red Dress Collection produced by the American Heart Association and Macy’s I decided it would be the best day to wear my Red Leather Moto Jacket by Eloquii which I am completely obsessed with. It gave the right amount of pop that I was looking for that day. 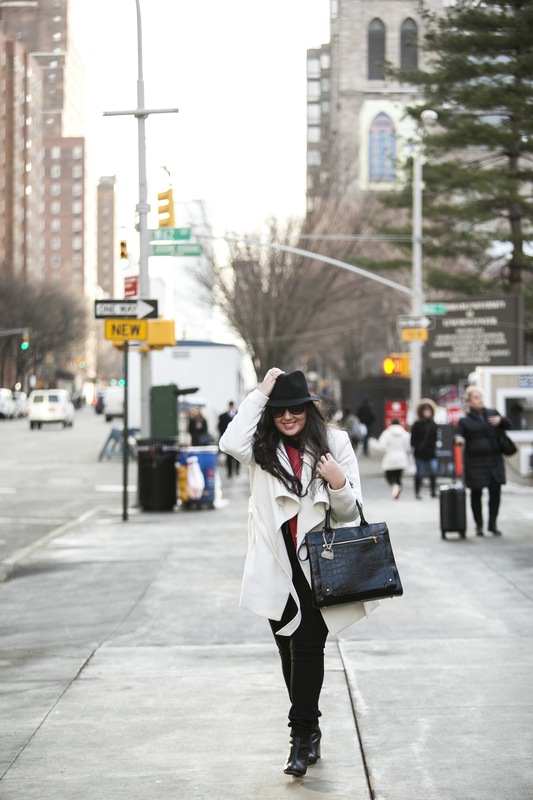 To keep the look going I wore my favorite black jersey turtleneck from Target, black skinny jeans, a white cropped over coat from, a black fedora and sunglasses from forever 21. As for Jewelry. I am obsessed with Lisa Freede and I wore many of her unique and stylish baubles to compliment the look including this sequin chain necklace. My Handbag that literally held everything and the kitchen sink was by Glass Handbag. The really cool attribute to these bags are that they have a battery pack LED light inside of them to illuminate the interior of the purse. It’s fantastic! Now, on this day of the week it was very windy and cold. Every time I took my hand off of my hat it flew off. If only I had a hat pin. Anyway, because it was so chilly outside I obviously needed to wear a coat but if I did not take it off for just a few moments you wouldn’t really get to see the detail of the Eloquii moto jacket ,all to well. So I braved the cold to show you what my outfit without my coat looked like. Here’s a look. We ❤️ Shoes – Really! The Perfect Valentines Day Bootie!